We are assisted by a crew of experienced personnel who are enormously indulged in bringing forth a broad gamut of Fume Scrubbing Systems. Designers, manufacturers & suppliers of pp / pvc / frp / grp chemical process plant equipments, tanks, vessels, hoods, ductings, blowers, filament wounded pipes & fittings, pp pump, fpr moulded articles and fume scrubbing systems for removal of hazardous & noxious fumes like hcl, nox, cl2, hbr, so2, chrome mist, triethylamine, etc. Evolved during chemical reaction. 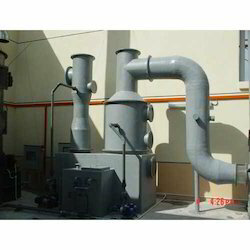 We are also engaged in presenting a broad consignment of Chemical Fume Scrubber. We are renowned manufacturers of fume scrubbers that play an important role in protecting the environment. Also known as HDPE scrubbers, these essential devices are used for handling corrosive chemicals. Manufactured using plastic, the various accessories offered along with these fume scrubbers are also made of plastic material. 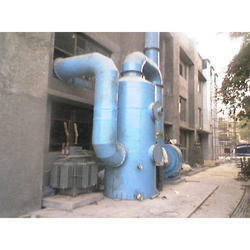 We are engaged in manufacturing and supplying assortment of Fume Excavation Scrubbers. Excavation through scrubbers are especially designed to scrub acidic fumes in plating shops and pickling booths. Moreover, installation of these systems enhances labor health, labor efficiency and improved plant and machinery life. We bring forth an exceptional quality range of Scubber Hood, which is perfectly designed under advanced technology. Our range of scubber hood fabricated in numerous shapes, sizes, lengths and widths to suit the specific requirements of our clients. Furthermore, these products are throughly tested to ensure their flawlessness. EPC INDIA can design, manufacture, and install high efficiency fume scrubbers to meet the most demanding air emission application. Our scrubbers remove airborne contaminants through gas absorption , mass transfer, or mechanical impingement, and can be designed to meet the strictest standards. We are not in the business of designing scrubbers. Scrubbers up to 12 feet in diameter. Up to 32 feet tall.